Mr. Delgado grew up between Nicaragua and Miami. 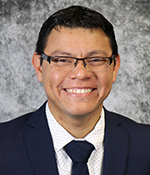 He is an international development professional with over seven years of experience working in communities across Mexico and Central America in the areas of human rights, youth empowerment and capacity development for civil society organizations. In the past he has worked for the Pan American Development Foundation, the humanitarian arm of the Organization of American States and several international NGOs. He received a Hilton Prize Coalition Fellowship to provide technical assistance to grassroots organizations, and also taught English to high school students in Nicaragua. Mr. Delgado holds a Master of Science in Latin American development from King’s College London, where he was a recipient of the prestigious Chevening Scholarship awarded by the UK government. He completed his Bachelor of Arts degree with departmental honors in international studies and political science from the University of Miami and obtained a Diploma in International Relations from a European Perspective from the Universidad Pontificia Comillas in Madrid, Spain, where he was a Benjamin Gilman Scholar. Mr. Delgado is passionate about Central American integration efforts, diplomacy and the role of the private sector in international development. He is a foodie and enjoys playing football (Hala Madrid), listening to Latin and indie music and traveling – having lived in four different countries before settling back in Miami.